I’m coming out… I want the world to know… Sang Diana Ross with gay abandon way back in the 80s. Of course, it was never intended to be an LGBT anthem of sorts, but it kinda stuck because of its lyrics, which perhaps a little whimsical at the time, connected by and large with oppressed individuals who had eventually come to terms with the fact that they were a little ‘different’ and well, they wanted the world to know that they weren’t ashamed of who they were. Even now, some forty years on, the song is interpreted as a celebration of lesbian, gay, bisexual, or transgender, identity and the encouragement of self-disclosure. That last line infuriated me because that is exactly the problem here. We’re so hellbent on pandering to the so called ‘front-benchers’, that Hindi trade ‘experts’ scoff at any film that attempts to stray from what is regarded as the ‘norm’. Mainstream films have always depicted homosexuality by resorting to camp stereotypes or with an intent to shame and/or invoke laughter at a section of society, but I’m sorry it’s 2019 and that just doesn’t wash with me anymore. Anyway. We digress a tad. Coming back to the film, Ek Ladki Ko Dekha Toh Aisa Laga primarily revolves around Sweety (Ahuja), a timid and introverted girl in a rural town in Punjab who has to bear the daily brunt of her over zealous traditional family who can’t wait to get her married off, and the complications that arise when a chance encounter with a struggling playwright (Rao), who inevitably gets smitten by her, threatens to derail her existence and expose a life-changing secret. The skeleton in her closet (literally as well as figuratively), of course, is that she’s in fact in love with another woman and she fears that their union may not find acceptance both in her family and in society in general. Ek Ladki Ko Dekha Toh Aisa Laga is a bold and brave, albeit slightly flawed attempt at depicting a sensitive issue with mainstream packaging. Debutant Dhar knocks a few scenes out of the park — the scenes depicting the bullying of a younger Sweety, her inevitable outburst, and the silent sketches in her diary that speak volumes are especially poignant, and inevitably brought a lump to my throat, probably because they’re so relatable. But there are a few blemishes here too and this is where her lack of directorial experience shows. For instance, it is the Kapoor-Chawla romance that you eventually end up rooting for and not so much the core love story, and this is perhaps where the film stumbles. It wants to and tries to say so much, but when it comes to the crunch it ultimately chickens out, which is a shame. Not that one really complains though. Kapoor and Chawla, still ignite the screen with their cutesy, flirty exchanges which will inevitably bring a smile to your face, and for the kids that grew up in the 90s those scenes will strike a chord of nostalgia. But that’s not what we brought a ticket for. And neither did we want to invest in Rao’s character arc or back story, because it completely distracts us from the story we really wanted to know about. The story of Sweety and why she’s so enamoured by her mystery maiden — and we deserved more than the ten minutes we were hurriedly rushed through it. For instance, a key scene that should have been a turning point in the film isn’t entirely convincing — namely the one when Kuhu, (Cassandra), flippantly comes out to Sweety mid-conversation and without much ado — I get the need for subtlety, but don’t just skim over key plot points, especially since we’ve waited nearly an hour to get there! Glitches aside, the film is expectedly lifted by it’s entirely affable cast. This is the Kapoors’ first film together and they don’t disappoint but the story could have benefitted from giving them a little more screen time. 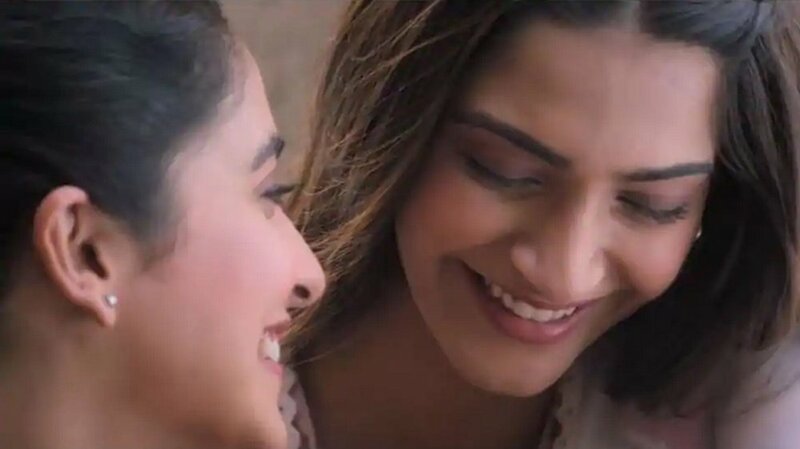 Senior Kapoor is as unabashedly charming as ever, and Sonam gets her moments, and she’s entirely competent but there are times where one wishes she would have taken her plight further down the river of emotion. Still, she gets huge brownie points for depicting a character which most mainstream actresses would have run a million miles away from. Rao, as always, is earnest and effortlessly natural, but the film perhaps benefits the most by a lovely, playful turn by Chawla, who almost entirely steals the show proving that even now, nobody can quite come close to her comic-timing when she raises her charm right through to the stratosphere. Is Ek Ladki Ko Dekha Toh Aisa Laga worth the ticket then? Yes! It’s not perfect, but needs to be lauded for its brave attempts to normalise an otherwise taboo subject, and that too with a mainstream cast. More importantly, it tells us that there are good stories to tell and that filmmakers are evolving or at least willing to think outside the box, and will attempt to push the envelope, if we give them half the chance and subsequently, the recognition they deserve.